If you would like to print a label for any of the jobs you’ve booked, it’s a simple process to make, once you have confirmed and paid for your booking! Select the label size you need, eg, 1 label/page will fill an A4 size page and 4 label/page will be 25% of an A4 size page. It will only print one label for you. 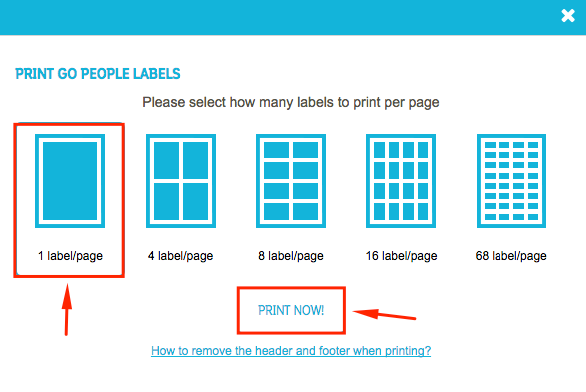 When you’re ready click on “PRINT NOW!” Your printer settings will take care of the rest! If you have already booked the job in and passed the Summary, go back to the Jobs dashboard and you can still print a label for the job from here. Select the job you want. Using the Actions tab, Select “Print selected jobs labels” from the drop down menu and just follow the Print Go People Labels from there.